Via Ferrata or 'iron routes' are combination walking and climbing routes that run across rock faces and up and down steep slopes using iron pins, ladders, rope bridges and safety wires for carabinas. 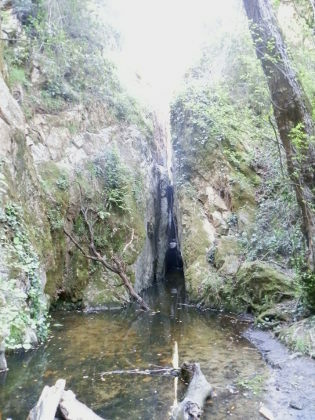 The Costa Brava has three Via Ferratas, with the easiest at the spectacular Gorges de Salenys in the hills close to Romanya de la Selva and Bell.lloc just outside Santa Cristina d'Aro. However, knowing it exists is one thing and finding it another. Although we knew where it was on the map, we didn't entirely know what the best route was to get there or what it would be like when we arrived. (See the update below - but basically if you're on the Romanya-Llagostera road, it's marked as Font Penedes - nothing about the gorge). Knowing it would be in the valley of Salenys we started just by the Urbanisation of Bell.lloc just outside Santa Cristina D'Aro just off the road up to Romanya de la Selva. We parked just by the intriguingly named Font Picant (spicy fountain - its actually ferruginous - containing iron). Like many natural springs in Catalonia, it's quite common to see people collecting water and filling large plastic bottles with the spring water. Agua de Salenys was once bottled and sold as for medicinal purposes as water from the Costa Brava (update: and is back on sale on the coast as of 2018), as can be seen on the faded advertising painted on the side of the house just at the bottom of Bell.lloc. We weren't very sure of our route to start with or where the Gorges started or connected. So to begin with we headed into the woods above Font Picant generally trying to head north and east. The path turns and then continues to the north through woods and past fields with corn flowers and poppies and maturing wheat giving views back towards the sea at S'Agaro. It's a steady up hill and we continually wanted to break off to the left, down to where we thought the gorges were, but there were no routes. 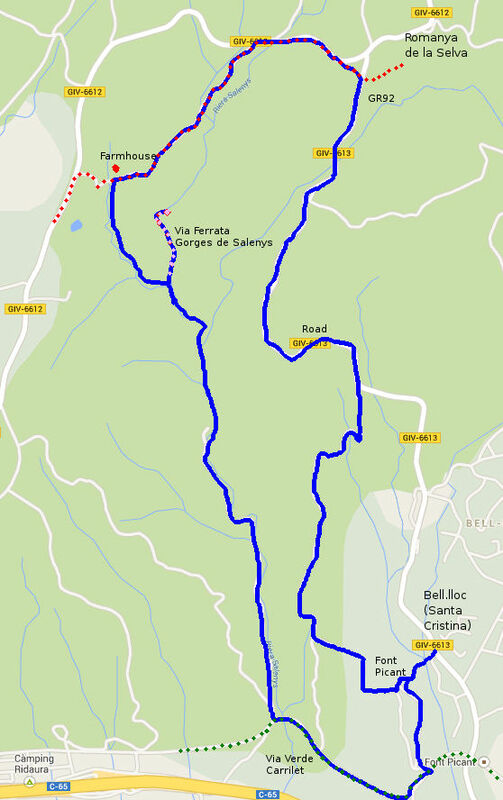 Instead, we eventually reached the road that links Bell.lloc to Romanya de la Selva. The road has been upgraded recently at the higher parts so it is broad with new tarmac and looks like it is made for hundreds of cars. Unfortunately we have to follow the road up, which though it looks like it should be busy is actually very quiet. Along the road we can see the valley dropping away to the left, but still no paths down. We can though hear, but not see, a cuckoo which almost seems to be following us as we walk. On the map we reach the first of the potential paths to the gorges only to see that it is a Cami Particular (private road). We carry on and join the GR92 cutting through a small copse before again joining a road that links to Romanya. The second potential path to the gorges is also a Cami Particular with the same sign as before. At this point we're close to Romanya de la Selva and at this stage it seems this would have been a better start point. We follow the GR92 (red-white flashes) to the left into the woods. We know from the map the gorges are to the left of us still and some tracks and paths go in the direction we want, but there is no sign post and when we try one it seems to get too narrow in among the lower trees to be a route. The actual access route we find just after passing a farmhouse - a path to the left is marked with a signpost to Santa Cristina d'Aro and the Via Ferrata. The path heads down a narrow river valley emerging at a picnic site where two large families are taking lunch, their cars parked nearby. We weren't expecting cars here and as we pass them and continue on the narrow pit-holed track they must have driven on, I don't think I would have brought a car. The valley though is quite deep with a small stream with water at the bottom and tall deciduous sycamore or plain trees. It's quite verdant and green being narrow and sheltered it doesn't feel as arid and mediterranean as the more open south facing slopes of the Gavarres, instead being more northern European in character without the normal cork trees and alzinas normally found on the Gavarres. To get to the Via Ferrata we have to take a signposted track down into the valley, and at the bottom we turn to the left, almost back on ourselves. We had assumed the gorges would be on the route to Santa Cristina, but in reality it is more like its own separate secret route. A few people are coming up out of the valley. The entrance is more or less a stream with some rope bridges and a path but at the far end it starts to get rockier and we can see the first of the wire-walk bridges above our heads and the valley narrows to rocky walls. Ahead of us the stream runs through a narrow crack between two rocks - less than a metre wide and along this section is are the wires of the Via Ferrata so you can take yourself through the narrow pass. To reach this part you have to work your way around pins stapled into the rock at a height of about 3-4m up. This is where you need climbing gear to do the Via Ferrata, which we don't have. A sign on the entrance also says that helmets, harnesses and carabinas (and climbing insurance) are necessary to do the via ferrata with the suggestion that they can be hired from Sant Feliu Adventures. 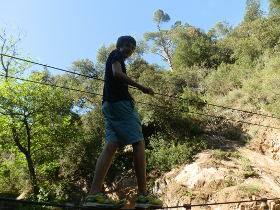 However, the via ferrata is not the only route up. There is a path to the right which takes you over the rocks - it's a bit of a scramble and we go up and discover that the valley is like a series of levels or steps with water pools on each level, then rocks to scramble up again at the back and further via ferrata routes up. We do a little exploring but then work our way back down and out, exhilarated by the possibilities. At the point we turned into the gorges, we turn to the left and take the path marked towards Santa Cristina at the stream level through the valley. 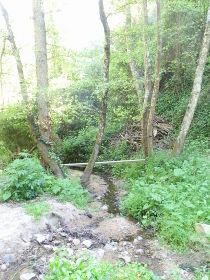 The walk is really pleasant with light dappling on the trees and the sound of our cuckoo in the distance. 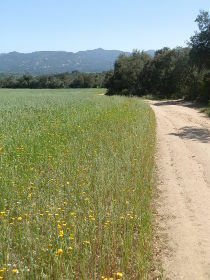 Eventually we pass the Aigua de Salenys bottling plant and reach a bigger gravel road, which then connects to the Carrilet Via Verde - the old train route between Girona and Sant Feliu de Guixols which has now become a long distance bike route. We follow the Via Verde almost as far as the old station (now restaurant) for Font Picant and turn back up to the park. So we tried again on the Sunday, but this time from the bottom of the valley. There is access from the C65 dual carriageway just before the Els Tinars restaurant and the path is clearly marked. The first thing is the bottling plant is back working. You can buy Aigua de Salenys in some of the restaurants on the coast. There was a group climbing - the Via Ferrata runs all the way to the top, but since it needs climbing gear, we haven't been that high. And at the top, we found the signpost to look out for from the road (our original walk connected via a footpath). At the top it's marked as "Font Penedes", and there is no obvious marking saying gorge from the top.